World's First Mobile Knee Registry!! Best Features: Simple record sheets, Digital Goniometer, Angle Measure tool, Knee society score, Knee function Score and Instant Statistical Graphs all wrapped in a beautiful visual interface which can be shared with your Patients, National Registries or Databases. First time ever an Android App to serve as personal record of Arthroplasty cases. 'Knee Registry' is the First of its kind app, build keeping in mind time constraints of busy clinical practice balanced with essential records of the patients. 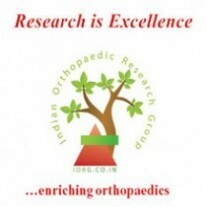 An excellent research tool to collect, store and retrieve data for total knee replacement surgeries. Made in most Simplistic manner but with robust design for collecting and saving data. 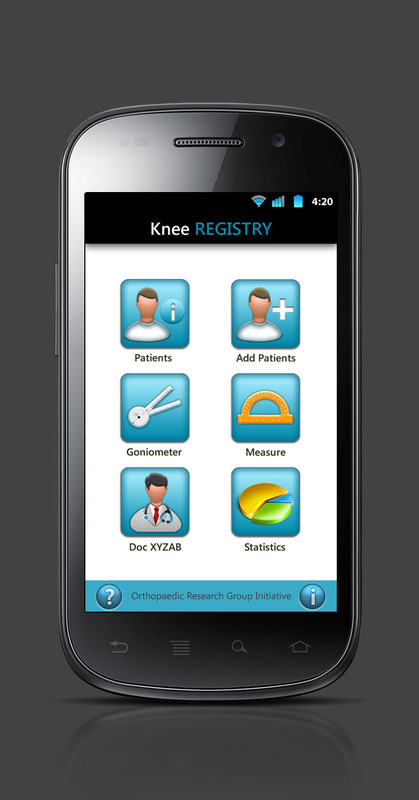 Based on the major registries of the world this application is easy-to-use with build in Knee Society Score and Function Score. The app is made after much deliberation from the research point of view. It can keep a detailed record of patients with facility to tag radiographs and clinical photographs. The records can be mailed to the surgeons, patients or to ‘Joint Registry’ directly from the phone itself. Regular backing up of the data needs to be done manually to laptops or to your emails (Google drive can be used in sync with the app). The App allows collecting data at different intervals including preoperative, intraoperative and postoperative patient visits. Multiple visits can be recorded which then automatically sync under the patients virtual folder. X rays and clinical photos can be attached to the patient profile from the phone picture library to create a complete record of the patient. A virtual Goniometer based on the accelerometer technology is the most beautiful part of the App. You can directly measure the range of motion, flexion deformities and other deformities by placing the edge of your phone to the appropriate surfaces. The interface might require some initial self-training to use, but when perfected will become an integral part of your daily clinical practice. The data from the Goniometer is directly fed into the patient profile. Direct angle measuring device is provided with the app. You can align the points of the tool and measure the angles like Hip-knee-ankle alignment (HKA axis) and other angles directly on the radiographs. The radiograph with measurement can then be saved in the appropriate patient folder. This is the most unique feature of this application. Basic categorical statistics can be done on the app itself and data from your data-bank can be segregated to provide ready-made graphs. These can then be used to show to patients, colleagues or in presentations. All this by simple touch.